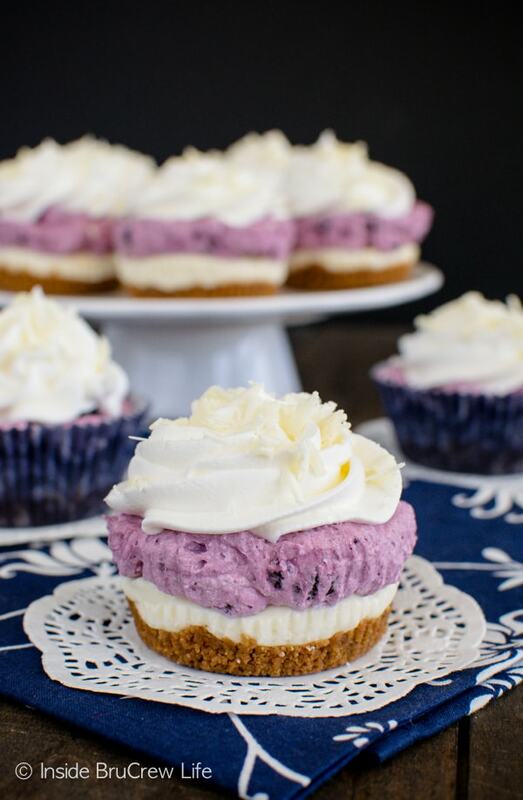 These easy White Chocolate Blueberry Mousse Cheesecakes have three layers of no bake goodness in each one. Cookies, white chocolate, and blueberry pie filling create an incredible sweet treat in minutes. On the weekends my husband and I like to catch up on different shows on Netflix. Of course, that means we have to binge watch for a few hours on that one night. We will try to stay up as late as we can since each episode drags you in more and more. Each one ends and you have to watch another one because you have to know what happens next. Before we know it it’s 2 am, and I can’t remember what happened in the last episode because I am falling asleep. The latest show we have finished is Fringe. I’m not usually a fan of sci-fi type shows, but we really got into the story line of that one. Now that it is over, we have been looking for a new series that we can start on. Does anyone have any suggestions for shows they liked? Until then, we are trying to catch up on last season’s Once Upon a Time. Our daughter couldn’t wait any longer for us, so she already started on this season. The bad thing is that she keeps trying to tell us what happens next, and we have to shush her. Ain’t nobody got time for spoilers! Now something you do want to make time for right now is some holiday baking. We are headed into the time of year where treats and sweets reign supreme. Pie, cake, cookies, fudge…you name it, we are going to make it. Am I right? 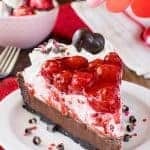 With all those treats taking up oven time, it is good to have a few no bake desserts to have ready to go for those last minute guests or parties. This cinnamon apple icebox cake is one of my favorites from last year. 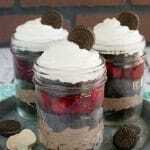 Today I’ve got you covered with a fun layered dessert. 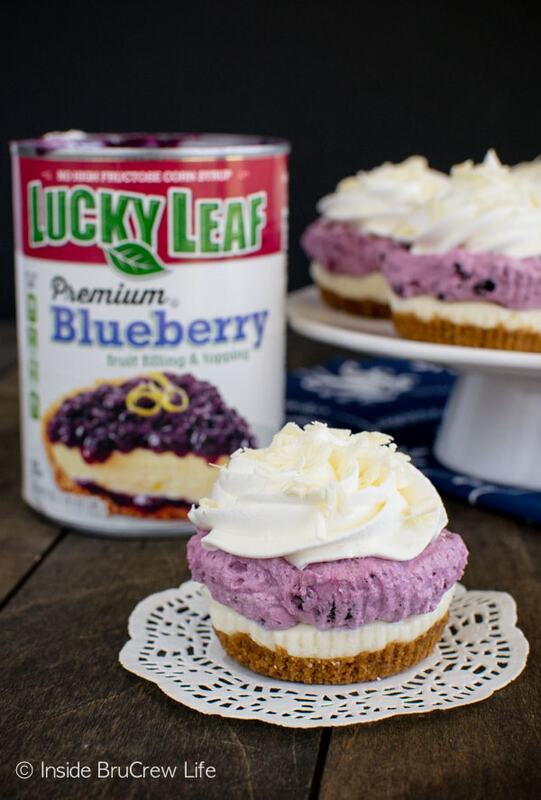 I am partnering with Lucky Leaf® to promote their Simple Treat contest. 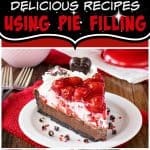 All you have to do is create a simple dessert recipe using a can of pie filling, enter it on Facebook by November 26th, and then wait to see if you win. Ten lucky finalists will get their recipes shared online for the public to vote on. How fun is that?!?!?! 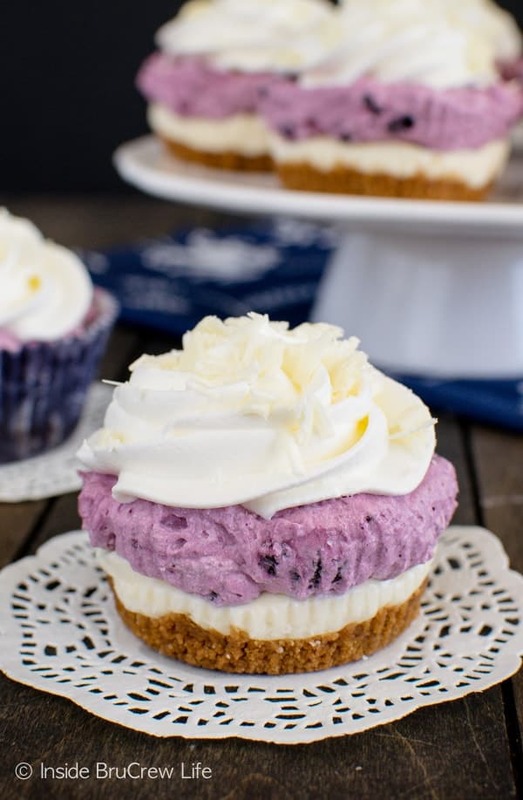 For these easy cheesecakes, I layered a cookie crust, no bake white chocolate cheesecake, and a blueberry mousse topping. Easy peasy dessert done in under 30 minutes. Gotta love that! 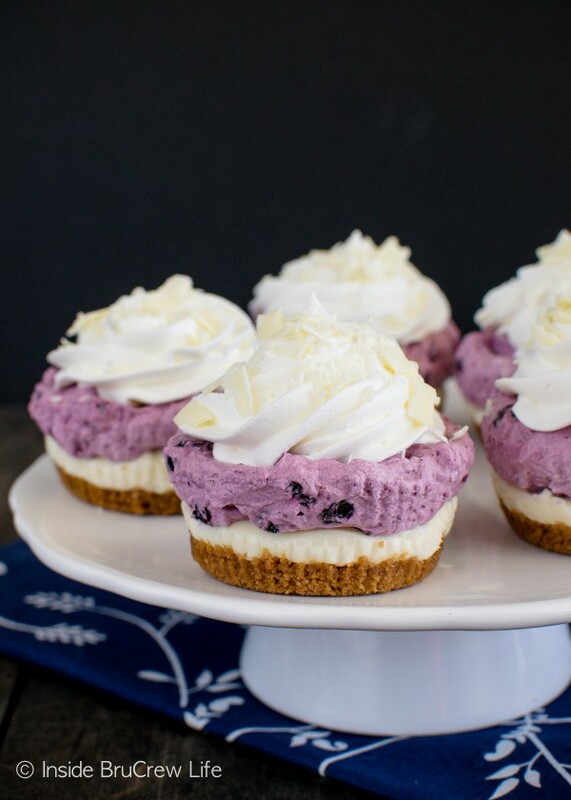 The best part of these white chocolate blueberry mousse cheesecakes is that you do not need any fancy equipment or pans to make them. A bowl, a mixer, and a muffin tin are really all you need. Oh, and a few spatulas too. Just things you should already have in your kitchen. Set out the cream cheese ahead of time. Cream cheese is easier to whip up when it is soft. Go ahead and pop it in the microwave for a few seconds because even I forget sometimes. Beat the cheesecake ingredients until they are smooth and fluffy. Spoon it onto the crust. Fold together an entire can of pie filling and some Cool Whip. This will come together and create a fluffy mousse. Resist the urge to grab a spoon and dig in. 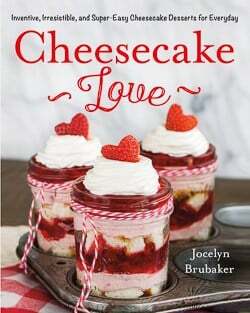 Cover the tops of the cheesecakes instead. Refrigerate for a few hours to let the cheesecake set up. Feel free to layer everything in small jars though because you know you want to eat it right away. 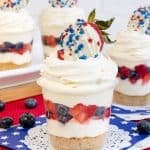 Use the remaining Cool Whip as a garnish and add some white chocolate flakes since a pretty presentation is everything. 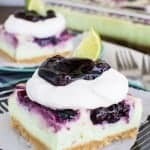 These easy White Chocolate Blueberry Mousse Cheesecake have three layers of no bake goodness in each one. Cookies, white chocolate, and blueberry pie filling create an incredible sweet treat in minutes. Place 24 cupcake liners in a cupcake pan(s). Mix together the cookie crumbs and butter. Spoon evenly into cupcake liners and press firmly into the bottom of each liner. Set aside. Beat the cream cheese until creamy. Add the powdered sugar and vanilla and beat again. Melt 4 ounces of the white chocolate according to package directions. Spoon into the cream cheese mixture and beat until creamy. Add the heavy whipping cream and beat until light and fluffy. Spoon the cheesecake mixture evenly on top of the prepared crust. Smooth each one out with the back of a spoon. 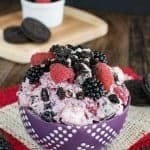 In a large bowl, fold together the fruit filling and 3 cups of Cool Whip to create a mousse. Spoon the blueberry mousse evenly on top of the white chocolate cheesecake layer. Smooth it out with the back of a spoon. Refrigerate 4-6 hours. Spoon the remaining Cool Whip into a piping bag. Swirl on top of each cheesecake using a large star tip. Use a vegetable peeler to shave the remaining white chocolate into little pieces. Sprinkle on top of each cupcake. Store in a sealed container in the refrigerator. Just the thought of blueberry mousse has got me drooling, these are stunning! These look so pretty and delicious! Love the color! That blueberry mousse looks so good with the white chocolate. Love all the tips!! What gorgeous little cheesecakes! Oh my goodness, these look absolutely heavenly! Love that these are no bake! They’ll look great on the Thanksgiving dessert table! These look GREAT!! 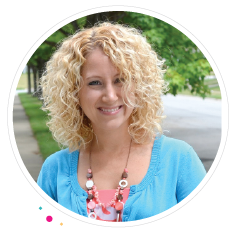 And so funny–my husband I try to watch netflix together too–he manages through 6 epiodes and I am asleep halfway through the 2nd!